The fiancée of a cameraman who was shot to death during a live television broadcast Wednesday morning released a statement on her Facebook page, expressing her heartbreak while thanking her supporters. 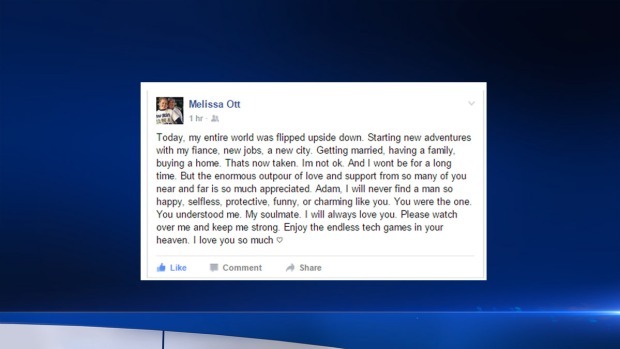 Melissa Ott was celebrating her last day on the job at WDBJ-TV in Roanoke, Virginia, when her fiancé, Adam Ward, was shot and killed during a live broadcast. Ward, 27, was the cameraman with Parker. 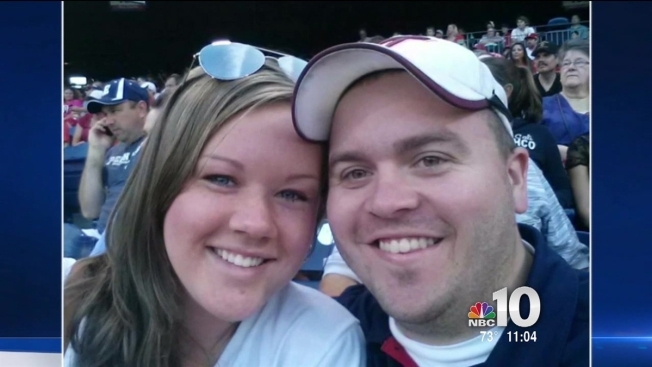 They were ambushed and killed while Parker was interviewing a woman on live TV at about 6:45 a.m. The station was on lockdown for hours during a manhunt for the shooter, identified as former WDBJ reporter Vester Flanagan. The 41-year-old suspect, who went by the on-air name Bryce Williams, shot himself during a police pursuit along a Virginia interstate. He was airlifted to a hospital in Fairfax County where he died. Ott had arrived to work Wednesday before the sun came up and was greeted with a beautiful bouquet of flowers and balloons. She and Ward were headed to Charlotte, North Carolina, for Ott's new job. Big shout out and congrats to our awesome WDBJ7 producer, Melissa Ott. Congrats to her on her new job in Charlotte ... we will miss you!!! Adam Ward asked Melissa Ott to marry him in April. Chris Hurst, an anchor for WDBJ-TV who attended Temple University, revealed to Twitter followers Wednesday he and Parker had been dating for 9 months and "were very much in love." The two had also recently moved in together, according to the tweet. "I am numb," he added. Hurst said he and Parker had just celebrated her 24th birthday and talked about getting married.